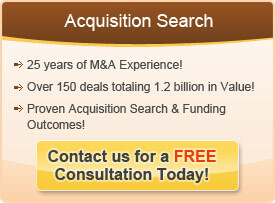 There are several stages to a Merger & Acquisition process to ensure acquisition closure and deal success. It starts with developing a well conceived acquisition criteria profile. Every company needs to have a clear idea of the type of company it is looking for. This needs to be written up and well defined so that the Merger & Acquisition Advisor can find the right types of companies in his search. The search needs to encompass a wide spectrum of deal sources and present professionalism to the listing brokers. Once identified, a review process is important to analyze the financials and the business model of the company. Valuation of the target is important to arrive at a price as well as a structure for the proposed valuation. Most acquirers take a legalistic approach to Mergers & Acquisition but it is recommended that the process of drafting letters of intent be handled by the Merger & Acquisition advisor. Throughout the process, it’s important that the acquirer and the selling company develop a relationship that will allow the parties to move forward post closing in a constructive manner. Once the letter of intent is negotiated and agreed to, the next stage is the due diligence process. It is important for the buyer to conduct both financial and business review to understand the customers, products, operations and finances. Diligence should be focused and allow the buyer to understand the negatives as well as the positives of the target company. The final step in the process is the closing, which in itself can be a massive undertaking depending on the relationship between the lawyers. Don’t fear if the deal seems as if it is falling apart during the legal documentation process. Most good deals die at least two times throughout the process.